We’re used to prophets being young, like Jeremiah and John the Baptist. As prophets, after all, their job is to look ahead. 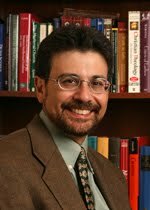 On the other hand, we think of elders as caretakers of the past. But Pope Francis asks us to see our elders looking ahead to the future. He gives us Simeon and Anna as our role models. In his February 2014 homily on the Feast of the Presentation of the Lord, Pope Francis asked us to consider Anna and Simeon as senior citizen prophets. This older woman and man have just met the new parents Mary and Joseph bringing their baby Jesus to the Temple. “It is a meeting between young people who are full of joy in observing the Law of the Lord, and the elderly who are filled with joy for the action of the Holy Spirit,” Pope Francis preached. “It is a unique encounter between observance and prophecy, where young people are the observers and the elderly are prophetic!” Pope Francis frequently talks about the gift that older women and men are to their communities. They are not to be thrown away but cherished as valued members. Before we get to the heroes of this story—the wise elders Simeon and Anna—we should reconsider this ancient but overlooked feast and its meaning. The Feast of the Presentation of the Lord recalls Jesus being presented to Yahweh’s service. But we can also look at this gospel scene through Pope Francis’ eyes to see Simeon and Anna, wise senior citizens, prophetically presenting Jesus as Messiah to the world. The Feast of the Presentation of the Lord falls on February 2, which is 40 days after Christmas. A holy day for Mary called her Purification was sometimes connected with its celebration. That span of 40 days after Christmas is the key. The number 40 relates to the Jewish custom found in the book of Leviticus (12:2-8). This rule stipulated that a woman who gave birth to a boy was ritually impure for 7 plus 33 days. This tradition continues in some Jewish communities where women have a ritual cleansing in a bath called a mikvah after menstruation or childbirth. 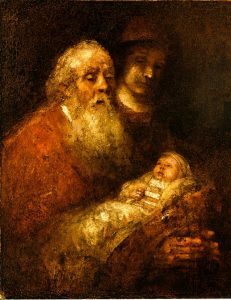 The Presentation of the Lord was observed in Jerusalem with sermons on Simeon and Anna as prophets of Jesus’ identity as the Messiah by the end of the fourth century. Through the Middle Ages, the celebration became associated with candles since Jesus is the light in the darkness. 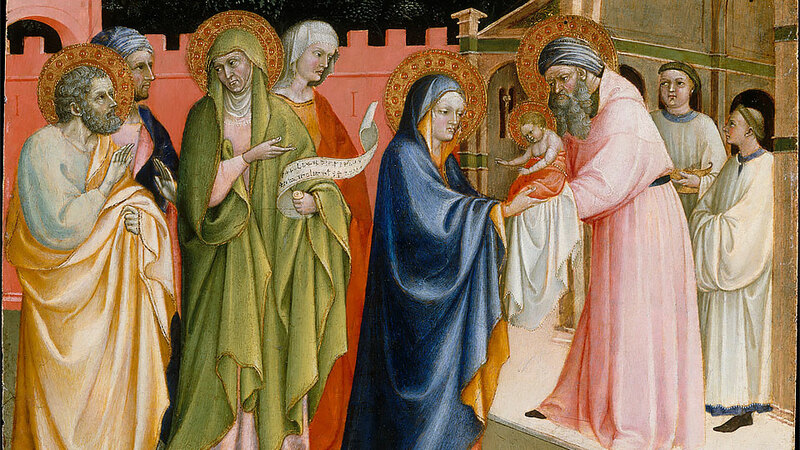 This feast was called Candlemas and was marked by the blessing of candles that were then carried in procession, sometimes emphasizing Jesus’ Presentation but in other times and locations marking Mary’s purification. After Vatican II, church officials overhauled the liturgical calendar to make it more historical. It is in this revised Roman Calendar, which regulates Roman Catholic liturgy today, that the Presentation of the Lord is celebrated on February 2. The day celebrating Mary’s purification is now called the Memorial of Mary’s Presentation and assigned to November 21. It honors Mary as the temple in which the Lord would become human. The day commemorates an event that is not found in the gospels when, at the age of 3, Mary was brought by her parents to the Temple and consecrated or presented to Yahweh’s service. Mary’s parents aren’t named in the Bible, either, but legends call them Joachim and Anne. Simeon and Anna bridge this generation gap when they play the role of prophets to all succeeding generations. 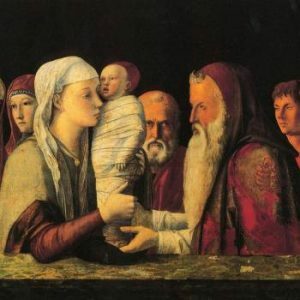 If we recall the excitement of bringing a child to church for baptism today, we likely touch the feelings that Mary and Joseph had when approaching the Temple with a baby not even seven weeks old. They had faith in the angel’s promise to them of the role this special child would play, but surely they were nervous about being caretakers of the Messiah. Anna and Simeon are not blood relations to Mary or Joseph, but they say amazing things that must have touched these new parents deeply. Simeon and Anna teach us several spiritual lessons. They teach us to keep praying. They teach us to have faith that God’s timing is not our timing. They teach us to have trust even if God’s promise is taking longer than we’d like. Finally, they teach that when we hear good news, we can’t keep it to ourselves. Even at the end of their lives, these two prophetic senior citizens were still paying it forward.